If you have hardwood floors in your home, then you know how difficult it can be to keep them clean if you don’t have a good vacuum cleaner. Getting out the broom and dustpan every time you have a little mess can be time consuming and back breaking. That’s where the Dirt Devil Power Air Corded Bagless Stick Vacuum, SD20505 comes in. The Dirt Devil SD20505 is very easy to use. 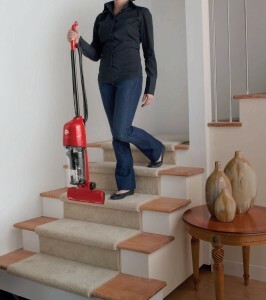 This handy vacuum cleaner is designed to clean hard floors without a lot of hassle. 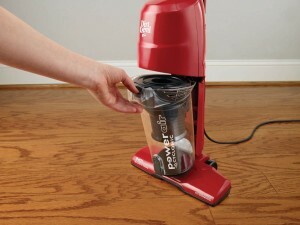 It is light enough to get out any time you have a mess or spill and it’s easy to operate. It is more powerful than most stick vacuums, so you won’t be leaving any messes behind. This vacuum truly is a time saver when it comes to cleaning your hard floors. Convenience is always a major selling point in products like this. This vacuum is no different. Since it weighs only 7lbs, it’s easy to transport from room to room without a lot of hassle. Since it has one of the most powerful motors for a stick vacuum in the industry, you won’t have to spend a bunch of time retracing your tracks to pick up dirt and debris that was missed. You will be able to get everything in the first pass. It’s not designed to go on carpet or rugs, but it is powerful enough to use on those surfaces for a quick cleanup in an emergency. Many people struggle with replacing the dirt cup after it is emptied. That is something to keep in mind, especially if you don’t have a steady hand or have a hard time seeing little details in order to assemble it precisely. A powerful machine is good if you know how to use it. That’s the case with this vacuum as well. When using it on hard floors, you may notice that dust gets spread around a little bit because of the air release. That is going to happen, so you will have to use it a few times to get a handle on the best way to approach vacuuming your floors. Also, with just a 20-foot cord, you may have to get out an extension cord if you are cleaning a large space. Otherwise, you will have to move to different outlets to get the job done. You need to buy the Dirt Devil Power Air Corded Bagless Stick Vacuum, SD20505 because it will save you a lot of trouble when cleaning your floors. Dirt Devil is a reputable brand when it comes to floor care products at a reasonable price. This particular model can be found on Amazon for a great price of around $30 when it’s on sale. You just can’t beat the value that this vacuum offers. And don’t be scared about the relatively cheap price. Dirt Devil makes a quality product that should last you a good amount of time if you take care of it. This model is no exception. Dirt Devil is one of the few names in the floor care industry that most people have heard of. A lot of people have owned some sort of Dirt Devil vacuum in their lifetime, whether it’s a handheld vacuum or a larger vacuum cleaner. The company was founded about 110 years ago and continues to be one of the leaders in the floor care industry. Dirt Devil caters to all of their consumers, whether they are commercial or residential buyers. As a result, Dirt Devil is one of the most popular brands that people look for when shopping for a new vacuum cleaner.